The time of mobile point of sale (mPOS) has arrived. While the mission to adopt EMV has dominated the payments industry over the past few years, many hotels, resorts and casinos are now focusing their efforts on rapid planning and implementation of mPOS strategies. A number of emerging trends are driving this new focus, including an emphasis on enhancing guest experiences and building brand loyalty by leveraging digital and mobile technologies. Innovative hotels, resorts and casinos are using these solutions to create entirely new guest experiences that improve service speed and convenience while creating distinct competitive advantages. mPOS is increasingly becoming a key part of the picture, providing unique opportunities to improve guest service quality and engagement, create new efficiencies and cost savings, and strengthen their brand. 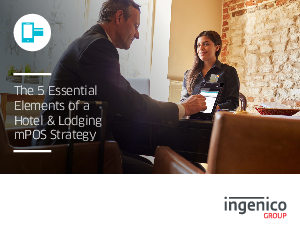 This eBook will provide an overview of those opportunities, some key trends in the hotel & lodging industry, and guide you through the key requirements you should consider while implementing your mPOS strategy.